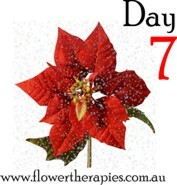 On the seventh day of Christmas, Australian Bush Flower Essences gave to me… Paw Paw (Carica papaya). Whenever you are exposed to a long-string of situations and events where you are outside of your normal routine, it is very easy to start to feel a little overwhelmed and sometimes even unwell. Unusual bedtimes, rich foods, alcohol and excessive socialising can all take their toll on you, and Christmas is a time for all of these possibilities and more. Today’s featured Australian Bush Flower Essence, Paw Paw, is the perfect Essence to deal with the issue of excessive intake of food or new experiences and can help you to absorb the nutrients and events that you want to, and discard the rest. It is to be expected that you can start to feel sluggish, tired, low on energy and not functioning as well as normal when your body is pushed to the hilt, without your normal diet and activity levels which it grows accustomed to (especially if your diet and health regime is normally one full of nutrients and moderation!). So today we are going to take a look at a few ways that Paw Paw Essence can help you to overcome any digestion and information overload problems and also help you deal with all the new experiences you are exposed to during the festive season. Dealing with seasonal overwhelm: As much as we enjoy socialising with others, eating out at exotic restaurants and keeping late hours during the festive season, all these aspects can cause great levels of stress to the mind and body. Enjoyed in moderation, of course, all of these activities provide great enjoyment and create wonderful memories for us. But how do we know when is enough and which events we should miss? Paw Paw Essence can help you to be true to your own physical limits by aiding you with: the physical digestion of the foods you are enjoying; the rollercoaster-ride of emotions that you may experience via your interactions with people you love, people you dislike and people you may not have seen all year; the mental processing of all the unusual and unique experiences you may enjoy during your gatherings; and also the foreign locations you encounter during any international travels. By using Paw Paw Essence you may find that you maintain your normal levels of health, feel much more your ‘usual’ self and actually stay physically well enough to enjoy all the experiences you have planned this Christmas. Staying on course and true to your plans:Paw Paw Essence is a wonderful remedy for getting in touch with your ‘higher self’ (or whatever you prefer to call your ‘higher levels’ of wisdom or intuition) when wanting to make decisions from a deeper perspective. This can be very helpful at this time of year, as it may enable you to better experience the things you have planned, while skipping the events that may not quite resonate with you. It can also help you to stay true to your visions, ideas and perceptions through all the additional information you can find ‘coming at you’ during the festive season. ‘Digesting’ only the things you want to: As you would well be aware, the Christmas season usually comes ‘armed’ with an onslaught of information from the media about what you should be buying, who you should be partying with, how you should be making your house look and what sorts of gifts you should be giving. To take all of this information in and survive to tell the story would be a true Christmas miracle! Paw Paw Essence can help you to only absorb and ‘digest’ the information you were actually seeking and the things that you do want to retain in your mind. It is a key Essence for learning (you will most commonly find this Essence within the ‘Cognis’ combination made by Australian Bush Flower Essences) and one of the reasons it is so useful is because it helps you work out what you do want to learn and retain, and effectively allows you to discard the excess information that wasn’t for you. With a little help from Paw Paw Essence, this Christmas will see you ‘digesting’ not only the rich foods, but also taking from your experiences the things you want to retain and remember – leaving you with a happier, more manageable festive season and a better start to the New Year. Tune into tomorrow’s installment for an Essence that can help you achieve better levels of balance this festive season: inside and out! Don’t miss out on any of the Essences by subscribing to my blog here.